Health Savings Account (HSA) health insurance plans have been steadily growing in popularity since they replaced Medical Savings Accounts about nine years ago. There are two basic reasons to consider an HSA: saving money on your taxes and generally lower premiums compared to conventional copay type health plans. Once you grasp the basic functionality of HSA health plans, you’ll realize they are much simpler and easier to understand than the still more common copay programs. 1. You set up an HSA account. 2. You direct money into an account pre-tax. 3. You can use that money to buy and pay for healthcare related expenses. With HSA plans, you choose a deductible amount that typically ranges from $1,250 to $5,000 for individuals and $2,500 to $10,000 for families. Most plans today offer free preventive care with no cost to the insured for standard annual physicals or associated lab work and diagnostic testing. 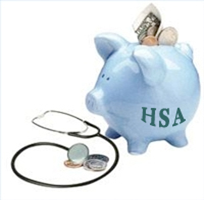 Under an HSA system, you pay for all costs up to the deductible amount. Once the deductible is met, the insurance company pays at a rate that is typically 80% to 100% of all costs above the deductible. This sharing ratio is called coinsurance and regardless of how the costs are shared, the maximum out of pocket expense for you is $5,000 for individuals and $10,000 for families. If your health insurance plan meets the guidelines described above, and is deemed HSA-compliant, you gain the advantage of paying for your out-of-pocket health care costs with pre tax money by opening a Health Savings Account through your health insurance company’s banking partner or even your local bank. Whatever contributions you make to your HSA (within IRS limits) are exempt from income tax when you file your annual tax return. Your tax savings will be dependent upon your tax bracket but I like to use a general guideline that people will save about 25%. That means if you contribute $2,000 to your HSA pre-tax, your out-of-pocket expense will likely only cost you $1,500 after taxes to make this money available for medical expenses. For further explanation of how this works, please feel free to contact me. A couple of other factors to look at when considering HSA coverage is the broad availability of those funds, as well as the ability to roll over unused HSA money each year. You can use HSA money for health products and services that your health insurance plan doesn’t cover such as dental and vision care. A common misconception with HSAs is that account holders have to forfeit funds they don’t spend by the end of each tax year. This is not the case. All unused funds remain tax-deferred to age 65 just like your IRA or 401K. With the lower monthly insurance premiums and tax savings associated with HSA health plans, the vast majority of my clients save money when annualizing total health care costs without any compromise of health care quality of coverage. There are however, a few scenarios where a higher premium copay plan is more cost effective in the long run. An example may be someone with significant monthly prescription needs. This is a basic explanation of how HSAs work, but be sure to consult your local health insurance specialist to help you make the best health insurance decision for your situation. Your friends at Affordable Health Solutions in Portsmouth, NH are always available to answer your questions on health insurance coverage.